What Are the Chances of an Expensive Medical Bill? Recently I made the argument that you need to have health insurance. Sometimes when people go without insurance they do so because they feel that the risk of a large health care bill is not high enough to warrant the cost of insurance. I thought it would be useful to see what the actual risks of a high health care bill look like. 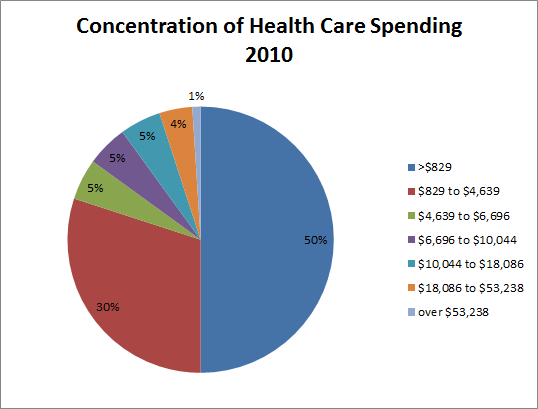 The Kaiser Family Foundation has data on the concentration of health care spending in the U.S. Their data there was from 2010 so the figures are a little higher now, but the general trend should be about the same. I took their chart and reformatted into a pie chart to show the mix of spending for the different population groups. Half of the population spent under $829. 80% of the population spent over $4639. So you can see the vast majority of the population spend under $5000. Only about 10% of the nation spent over $10,000. The top 1% spent over $53,238. OK then roughly speaking, there is about 1 in 10 rate of spending over $10k and about 1 in 100 rate of spending over $50k. Now keep in mind that this is looking at the entire population so you'll have higher and lower typical spending levels for different age groups. For example people over 65 years old will spend more than average and people in their mid 20's might be much lower than average. I also tried to find data on very expensive health care costs like $100,000 or $250,000 or $500,000 levels but I could not find anything saying what percent of people have such high bills. I suspect those hefty bills are a small fraction of the population though. Someone might look at the chart and think well if the risk of a $50k bill is only 1% then I can risk that. However keep in mind that a full 20% of people spend about $5000 or more and another 30% spend around $1-5k. If your insurance cost is around $3000 a year then we could estimate that there is probably about 1 in 3 chance of repaying your insurance in any given year. Plus there would be about 1 in 5 change that your health costs would be significantly higher than your insurance costs. So its not just looking at spending $3000 to avoid a 1% chance at a $50k bill. You are actually a lot more likely to have a $5000 or $10,000 bill which is still a pretty hefty burden. I'd also point out that insurance is never a straight odds gamble but the point is to insure yourself against the very high costs which would be catastrophic to your finances.